A standout two-way player at LaSalle Institute in Troy, NY, Butch was named to the All-Troy high school football Offensive Team all four years and to the All-Defensive Team his last three. After graduation, he chose Boston University and led the team in rushing his junior and senior years and in 1963 was named to the All-East team as a defensive back. 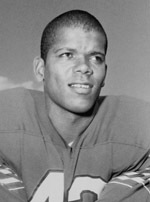 In 1964 Butch was selected in the AFL college draft by the Buffalo Bills and he made an immediate impact on the defensive side of the ball as a cornerback. Early in his rookie season, he ran back his first professional interception 72 yards for a touchdown; that wouldn’t be the last as he would later become the Bills’ all-time leader in interceptions with 40, returning five for touchdowns; he was seemingly always in the right place at the right time. Butch was a valuable member of the two AFL championship Buffalo Bills teams of 1964 and 1965 and was selected to five All-AFL teams. Butch was also an exceptional punt returner, and continues to rank among the Bills all-time leaders. In the 1966 AFL Championship Game, he returned a punt 74 yards for a touchdown and established championship game records for punt returns and punt return yards. Moreover, he played in every game as a member of the Bills during his tenure in Buffalo, starting 101 consecutive games. Butch was elected to the LaSalle Institute Athletic Hall of Fame, Boston University Sports Hall of Fame, Albany Capital District Hall of Fame and named to the All-Time Buffalo Bills Silver Anniversary Team in 1984. After a long career in business, Butch is retired and lives in Westin, MA.